I first saw the golden seashell in Denmark, a bright fan of gold lines extending outward from a single point over a blue field. If I didn’t know it was a shell, meant to represent the real shells pilgrams brought back with them to prove their journey, I’d say it looked like the last rays of sunlight over the sea. 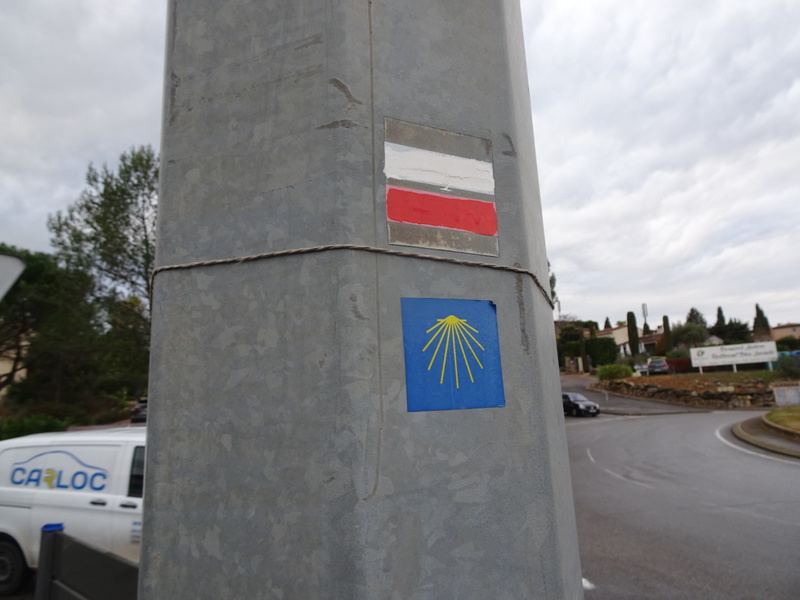 It hung on a simple wooden post to point the way toward Santiago’s great cathedral thousands of kilometres away. I didn’t follow it then. I saw it again in Germany, near the border, then near Hamburg, and again as I passed Hannover and Frankfurt. I didn’t follow it then either. Each time the shell appeared for a moment, sometimes a single sign and sometimes miles, then disappeared to the west. The Camino is not so much a single trail as it is a network of paths weaving together toward Santiago like the kines on the shell all pointing to a single place. The farther away, the thinner the thread, but each step closer brings more footsteps, more travelers, deeper, more certain trails. It was a curiosity to me in the north, something I knew I would see again one day, but now it is my trail and each shell a hint that I am going the right direction. I find pieces as I walk, a few signs and markers that I trace one to the next until they fade away or I lose them on a turn. Then I make my own way west until I find them again. One sign swears that I’m only 1,521 kilometres away from Santiago, but it must be wrong because even a bird is 1,200 away and no trail is that efficient. It doesn’t matter really, it is only a distance and all I have to do is follow the seashells west. I’m still a touch too far for the path to be well marked, to share the road with other walkers, for more than a few people to even know the trail exists. It’s like a radio station, full of static, flickering in and out as you adjust the antenna. Each step brings me closer, makes the signal a touch clearer. One day all the static will disappear and the trail to Santiago will become as easy to follow as a highway. But now, it is just that faint signal, fading in and out as I walk west toward the seashells and the setting sun. Posted in Europe North to SouthTagged Camino, Camino de Santiago, ENS, Europe North to South, featuredBookmark the permalink. Enjoyed the radio analogy. It will be interesting to hear your thoughts on El Camino and the religious journey that make so many in good faith take that trail. I am reminded of the saying in Buddhism, “If you find Buddha on the road, kill him.” What we seek is within us, our singular journey. More later.